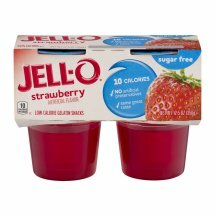 Jell-O Sugar Free Strawberry - 4 CT.Jell-O® Strawberry Sugar Free Low Calorie Gelatin Snacks.Artificial flavor.10 calories per snack.No artificial preservatives.Same great taste.1-800-431-1001.Visit us at: jell-o.com.©Kraft Foods. Water, Gelatin, Adipic Acid (for Tartness), Sodium Citrate (Controls Acidity), Citric Acid (for Tartness), Aspartame* and Acesulfame Potassium (Sweeteners), Salt, Red 40, Artificial Flavor. *Phenylketonurics: Contains Phenylalanine.